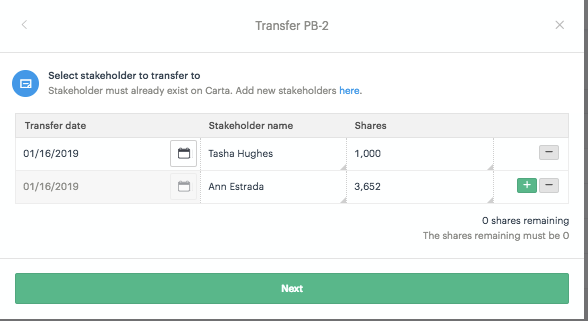 For one-off transfers, you can reflect transfers in Carta three different ways. If your company is going through a tender offer or secondary with third party buyer, you can complete this process through the Carta feature. Find more information about setting up a secondary here. Transfer the full amount of certificate to one or multiple stakeholders. The original certificate will be marked as transferred, and the new certificates will be issued. Transfer a portion of a certificate to one or multiple stakeholders. The original certificate will be marked as transferred, and the balance of the untransferred shares will be reissued to the original stakeholder as a new certificate. 1. 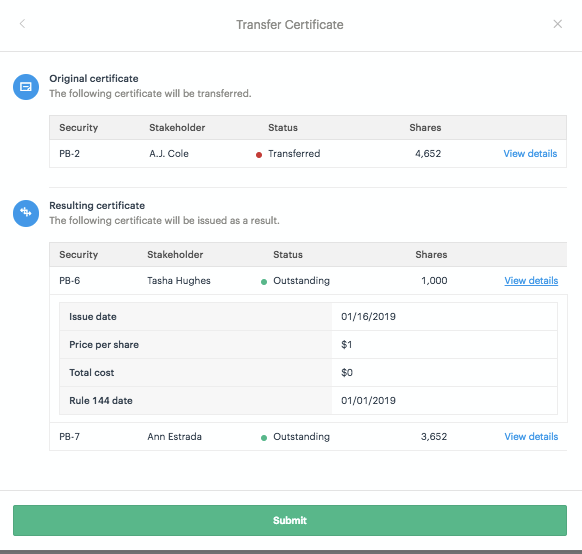 Go to the "Shares" ledger and select the row action "V" on the right side for the certificate you would like to transfer. Note: only electronic certificates can be transferred on Carta. Certificates that are "Issued as paper" will show as greyed out on the ledger and you will not see the option to transfer these. You will need to reach out to Support to confirm to paper certificates can be switched to electronic certificates and are only held on Carta. 2. Enter in the transfer date, stakeholder and shares to be transferred. For full transfers, all shares must be used. For partial transfers, any remaining shares will be issued to the stakeholder of the original certificate as a balance certificate. If the stakeholder does not already exist in Carta - you can add a new stakeholder on the "Stakeholder" page under "Stakeholders -> "All stakeholders." More information about adding stakeholders here. You can add multiple stakeholders to transfer the certificate to by clicking the green + button. If you add multiple stakeholders, the transfer date must remain the same. All required fields are noted and will be included on the resulting certificates. 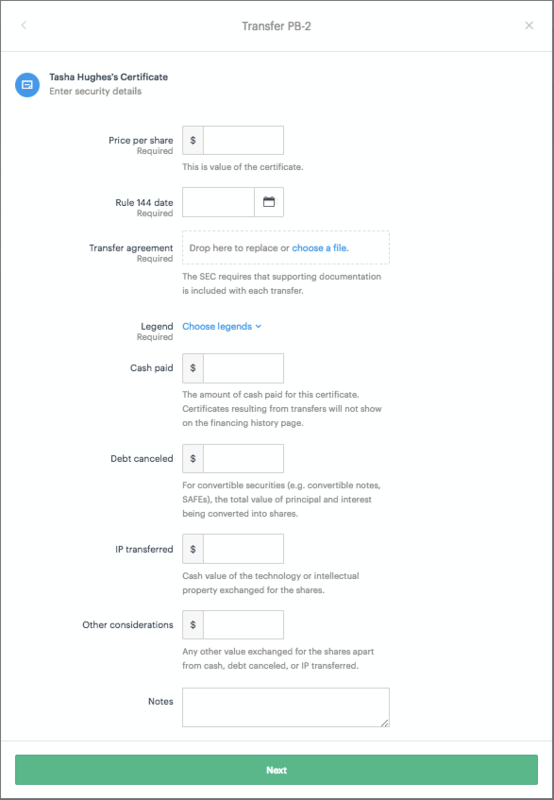 For multiple stakeholders, there will be a separate form for each new resulting certificate. The final step before submitting the transfer will be to review the certificates that will be affected. You can see the original certificate that will be cancelled as well as all certificates that will be issued as a result of the transfer. By clicking "View details" you will be able to review 4 of the main details entered.